In the traditional business environment, business processes evolve over time. As companies grow, most do not have the time or ability to implement infrastructure that continually enables effective collaboration, innovation or knowledge transfer. When implementing a business social network, the opportunity to create an infrastructure that fully enables employees, partners and other groups crucial to business success comes with the necessity to manage and measure its adoption. It also comes with great business benefits if done well. 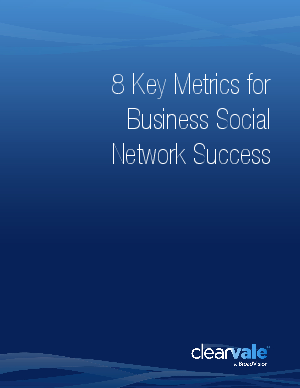 Read on to learn more about the 8 key metrics for business social network success.